If you’re like many parents, your New Year’s Resolution probably has nothing to do with you hitting the gym or starting a new diet. Rather, your focus is on changing something so that your child will be happier and healthier in 2019. 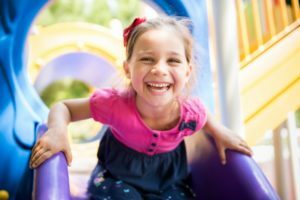 When it comes to improving a child’s overall wellbeing and self-confidence, prioritizing their dental health will give you the most bang for your buck by far. With Children’s Dental Health Month coming up in February, your children’s dentist in Oklahoma City is happy to share some helpful tips on how to improve your little one’s oral health this year. Most parents want to know what type of toothbrush or toothpaste their child should be using, and these are important questions to ask, but what matters more is consistency. If a child regularly brushes and flosses their teeth every day, they will more than likely have strong dental health. That’s true whether they use a manual or electric toothbrush or any of the endless flavors of toothpaste. Rather than stressing over the seemingly infinite amount of choice in the tooth care aisle at the store, focus your energy on making sure your child cleans their teeth every morning and night. Needless to say, many children don’t actually like brushing their teeth, and parents end up struggling to instill good habits. Rather than making dental care a chore, try to turn it into a fun game. There are plenty of free apps available on your phone where your child can brush alongside a cartoon character or with a song, and there are others that allow you to track how often they clean their teeth. If they do it every day for a week, perhaps they should get a little reward. You can also brush alongside your child to both set a good example and turn dental care into a family activity. Whatever you do, adding a little fun will make things much easier for both you and your child. Children love sugary drinks, whether that means soda, juices, or flavored water. Unfortunately, drinking these kinds of beverages all the time can wreak havoc on their teeth and seriously increase their risk for tooth decay. Whenever your child is thirsty, they should only drink plain water. This will help them avoid needless sugar, plus it will give their mouth a nice rinse. It’s best to treat the sweet drinks just like candy, in that they should only be enjoyed once in a while. Even if a child has a great homecare routine, they should still visit their dentist in Oklahoma City at least twice a year. Professional cleanings will remove plaque and tartar from those spots in their mouth they usually miss while brushing, and routine exams will allow their dentist to catch and treat any decay or damage as early as possible. Doubling down on your child’s dental care will keep them healthier and give them a smile their always proud to show off, and as a parent, not much sounds better than that! If you haven’t already, be sure to schedule an appointment with your child’s dentist so they can start 2019 off right! Dr. Michael Kirk is a family, restorative, and cosmetic dentist who has been practicing for over 25 years. An Oklahoma native, nothing makes him happier than to put younger patients on the path towards a lifetime of healthy smiles. To get more tips on how to take care of your little one’s teeth in 2019, he can be contacted through his website. by: Dr. Michael Kirk at February 8, 2019 .